Hailing from Detroit, Dwele, (who came into prominence during the time when Neo-soul/Nu-soul started being used as a term) started his musical life as many artists now do - on their own. His debut album "Rize" went through many hands before eventually ending up with Slum Village's manager, and soon after, Dwele was signed. The multi-talented artist can do more than most of his generation, he can play a variety of instruments and enjoys exploring. Dwele will be releasing "Some Kinda," his third album, through Virgin Records on October 4th. MVRemix: What's your first memory of soul music? Dwele: My first memory of soul music was Stevie Wonder's "Songs In The Key of Life." Turning it on and hearing "Contusion," "Contusion" was my favourite joint off that. That was right when I got my first record player. MVRemix: Did your singing come naturally or were you taught? Dwele: I think it came naturally. I did do schooling on piano and on trumpet, but that just really taught me the notes and taught me how to read. Soul music kind of came naturally to me, that's what I was raised on and I gravitated to. I picked it up and went off to listen to it. MVRemix: What keeps you inspired to continue to create? Dwele: Just life situations; ups and downs, goods and bads - I express myself. I express myself through music. That's my escape. So I mean just living is what keeps me inspired to keep creating. MVRemix: How did you first get your foot in the door? 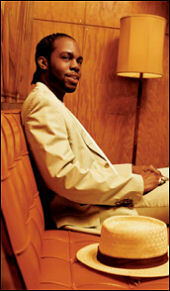 Dwele: I first was discovered when I put out my "Rize" album, back in 1998. I was discovered when I met Slum Village and they connected me with their management who took the actual project and shopped it around to different labels, that's how I got in this business. MVRemix: Tell me about "Some Kinda"
Dwele: "Some Kinda" is an album that's really talking about male/female relationships, but on this album I got a chance to talk about family love as well. It's a lot of different things mixed up in one. There's some serious notes in there and some more humourous notes. It's a little bit of everything mixed up in one. MVRemix: Can you tell me about guests or producers you have working on the project? Dwele: Yeah, on this one I worked with G-1 - the same guy that produced "Find A Way" on the last album. I worked with Mike City on the single, "I Think I Love You" and I also worked with Dilla and Slum Village on a song called "Keep On." MVRemix: How would you say it compares to "Subject"? Dwele: It's a step up. It's a little more musical. It's a little bit more me. It's not just my serious side, it's my everyday side. This is me more so than on "Subject." It's a great album, I can't wait to put it out. MVRemix: I interviewed Raheem DeVaughn recently and he told me his track "Is It Possible?" was originally meant for you. Did you two work together on this album at all? And how did the two of you meet? Dwele: Nah, he isn't on this album. We met when I took a trip to Philly to work on a few songs for A Touch Of Jazz. That's when we connected. I love his album, he's doing his thing. That's my peeps. We probably will work together in the future though. MVRemix: How do you manage to keep your content diverse while remaining on the subject of love and romance? Dwele: I think that it's the fact that I was raised on different genres of music. I was raised on Jazz and Soul. I've got a little Rock in me, I was raised around people that listened to Rock and of course, I grew up on Hip Hop as well. I think sometimes, depending on what type of mood I'm in. Depending on whether the sun's out or the moon's out I create music differently... Different music, the beat, kind of gives the song a different feel. But, a lot of times I like to speak on love because it's a major influence on my life. It's a major influence in everybody's lives. I like to talk about things that they (fans) can relate to. A lot of the time, no matter what the actual music is saying, I speak on love. MVRemix: How did your collaboration with J-Live come about? Dwele: I met J-Live when I was in New York. Actually J-Live was in New York for a few months while I was working on the album, and I came in contact with J-Live. He's a cool cat, he's a talented guy and he's doing his thing. It was fun working with him. MVRemix: How valuable do you think your knowledge of instruments is with creating new music? Dwele: I think it's good. I really don't read as much as I should, that doesn't really come into play as much when I'm creating. Some instruments I like to not really have knowledge on, because I don't feel confined to play instruments a certain way. I can pick an instrument up and whatever I feel or whatever sounds right, I'll put it down... Not really confined. I like to keep that open on certain instruments. MVRemix: Are there any solid plans at the moment for you to do more work with Kanye [West] or Slum Village? Dwele: Most definitely. I'm always working with Slum Village because I'm in Detroit and they're in Detroit also. We constantly stay in the studio together. I'd love to get up with Kanye and do another song with him. That was a good look and most definitely he's doing his thing right now. MVRemix: Aside from the album, have you been working on any guest appearances or collaborations? Dwele: I've always liked to try a little of everything. So yeah, I am looking forward to getting into different aspects of entertainment. Maybe even acting or writing plays or something. So I'm really looking forward to it. That's what I really love about the music business because it opens up so many different doors for you. Dwele: I just hope that everybody enjoys the album as much as I loved making it and that they'll find a new love in "Some Kinda" and I hope they'll support it. "Some instruments I like to not really have knowledge on, because I don't feel confined to play instruments a certain way. I can pick an instrument up and whatever I feel or whatever sounds right, I'll put it down..."